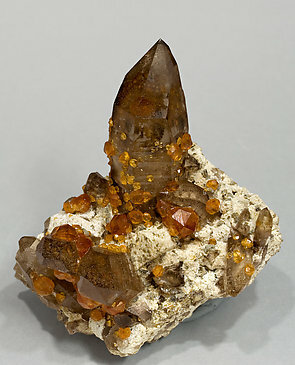 A floater flattened dodecahedral crystal with parallel faces due to etching typical for the specimens from this locality. The crystal is transparent and has a very deep and uniform color that acquires a special quality under an intense light. The sample is very rich in trapezohedral crystals, which have excellent color, brilliance and definition, on a matrix of white Feldspar. It is powerful. 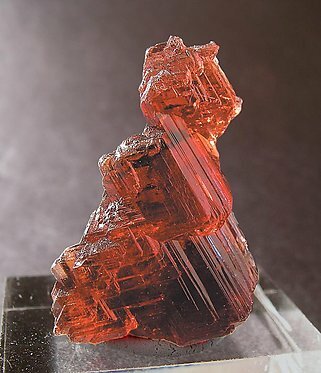 Group of trapezohedral crystals of Spessartine, bright, transparent and with a very intense color. They are coating a group of Orthoclase crystals. The lack of some crystals at the top is probably due to a contact, not damage. From the famous find of gem Spessartine from Lavra do Navegadora we obtained this enormous crystal that shows of all the great features of the find. Intense color, great transparency, a floater, complete and with dissolution marks on its faces. In this piece, just to add to everything else, the brilliance is extraordinary and, even though it is quite thick, the gem quality of the crystal is very visible when lit from the front and spectacular when lit from the rear. There is a little bit of Albite on this powerful specimen. 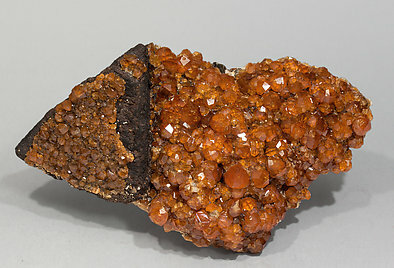 Druse with spheroidal aggregates of very well defined trapezohedral Spessartine crystals. 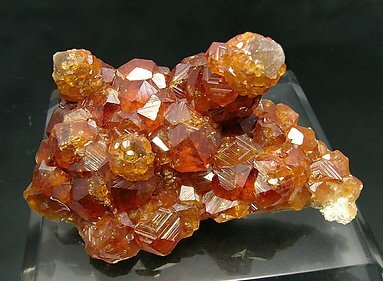 On a feldspar matrix, they are between translucent and transparent, very bright and have a very intense and uniform orange color. 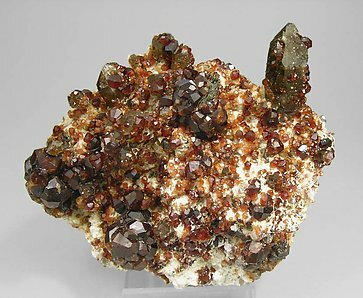 Relatively common just a few years ago, this kind of Spessartine is quickly disappearing from the mineral market. Crystals are sharply developed trapezohedra and they have an excellent color and luster. The crystals grew on a matrix of Feldspar, probably Orthoclase, with small crystals of Mica. The specimen has been published in the book ‘China’, by Berthold Ottens, on page 468. 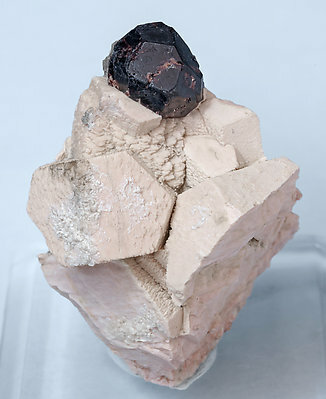 Trapezohedral crystal of Spessartine with very well defined faces and edges, translucent and having an excellent color and standing on a matrix of Mica with brownish Kyanite. 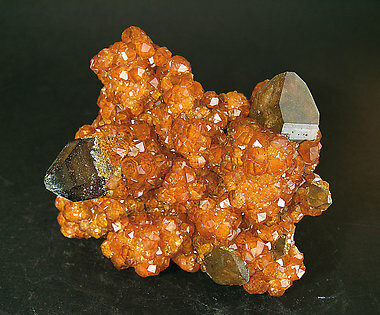 Group of trapezohedral Spessartine crystals with very well defined faces and edges, with a very intense orange color and on orange Kyanite with small Muscovite crystals. 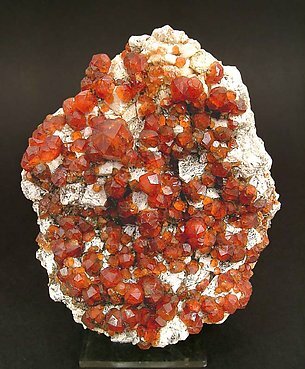 Druse of very well defined trapezohedral crystals, between translucent and transparent and with a very intense and uniform orange color. 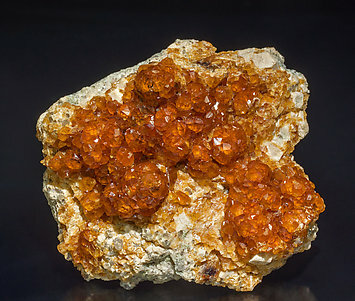 Smaller Spessartine crystals partially coat a pseudomorph after Helvine that has been completely altered to manganese oxides. Very aerial on its small Muscovite matrix, the trapezohedral crystal is almost complete and has an excellent definition of its faces and edges. Color, luster and transparency are magnificent. 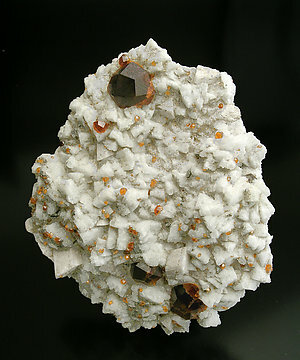 Floater crystal of very well marked polycrystalline growths, etch dodecahedron faces and with a very small Quartz crystal. Color, luster and transparency are excellent. 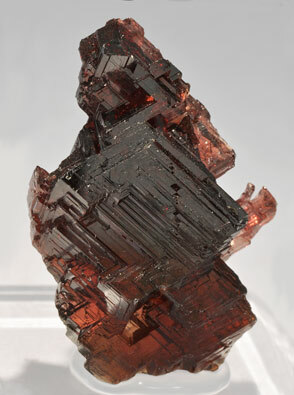 Spessartine crystals, one of them dominant, very transparent, notable for their color intensity and extraordinary brilliance. With very marked stepped faces produced by etching. On a Quartz matrix, which is rare. 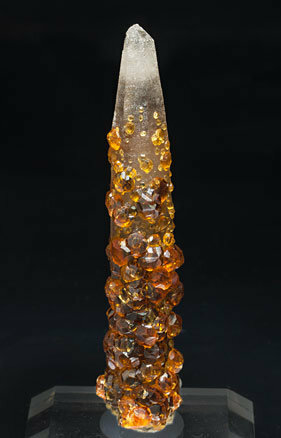 This specimen comes from the private collection of the well-known Wendy and Frank Melanson, from Canada. 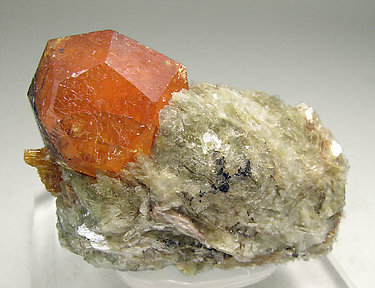 Trapezohedral crystals of Spessartine, very bright, transparent and with a vivid orange color. They are on matrix partially coating crystals of smoky Quartz and Orthoclase crystals. 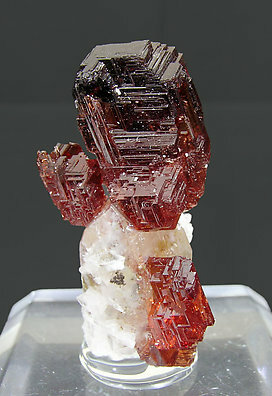 We especially note the inclusion of a complete crystal of Spessartine in the dominant Quartz crystal. 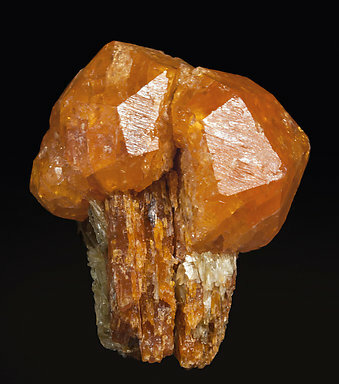 Smoky Quartz crystal partially coated by trapezohedral Spessartine crystals that are very transparent, bright and with a very attractive honey color. We note that good samples from this mine are increasingly difficult to obtain. Crystals are trapezohedrons and they are transparent and have extraordinary luster and color. 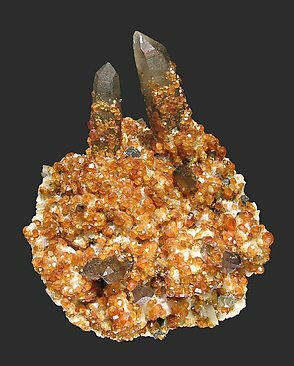 The specimen is very esthetic because Spessartine covers a group of Quartz crystals whose terminations appear in some points. 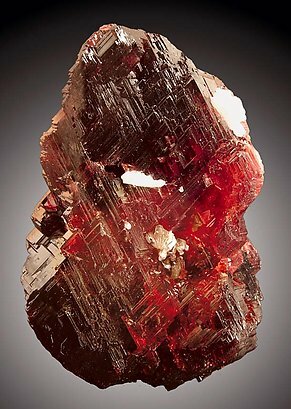 Excellent color and brilliance in the Spessartine and the smoky Quartz is particularly transparent. 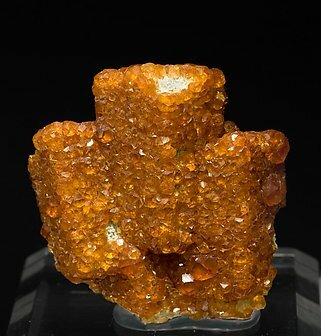 Numerous trapezohedral crystals, very transparent and of a magnificent honey color covering a group of smoky Quartz crystals. It has an added curiosity, in one of the corners of the sample there is a small but transparent and well formed octahedral crystal of green Fluorite, very bright. 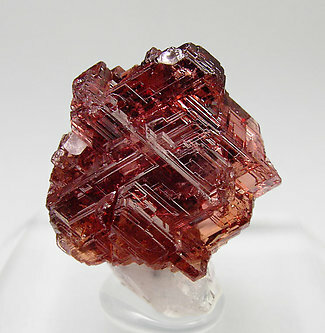 Very well defined crystals of Spessartine that are transparent and have lots of color. Smoky Quartz with good color and intense brilliance. Dotted across the matrix are groups of leafy crystals of Clinochlore. And all that is on a fine matrix, so it is a light specimen. It was photographed for the ‘what’s new at St Marie 2004’ section of the magazine ‘Minéraux et Fossiles’ and appears on page 35 of number 331. 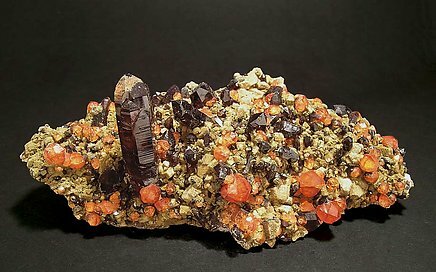 Groups and isolated crystals of Spessartine with very marked trapezohedral forms. 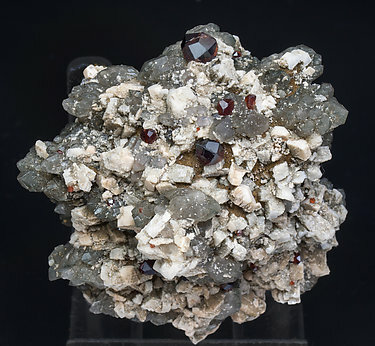 On Feldspar matrix (probable partially kaolinized Orthoclase) and with smoky Quartz crystals. The sample is from the Dr. Marvin D. Rausch collection whose label we'll send to the buyer with another two labels. 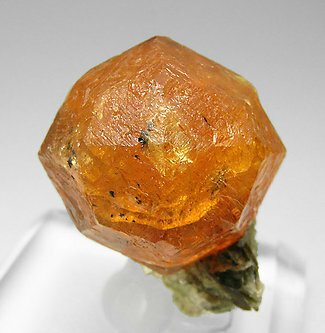 Very bright transparent gemmy trapezohedral crystals of Spessartine. 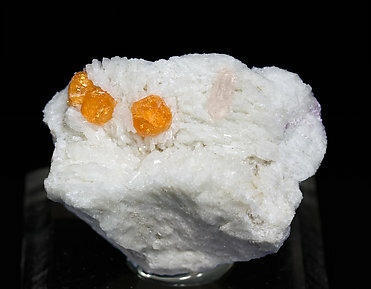 They have a vivid orange color and are on Albite matrix with a small crystal of Spodumene (Kunzite). The sample is with a Deyrolle (Paris) label that we'll send to the buyer.